I sit next to three girls at work and they love to talk about shopping. They introduced me to online "sample sales" where online sales are held to sell discounted clothes and accessories. But guess what, these sites sell discounted furniture and home decor accessories too! I did some digging around and found a bunch of these online shopping sites. The only catch is that you have to be a "member" of the site to access the sales. Luckily, membership is free but you need to be invited by another member in order to join. Once you join, you can pass along invites to your friends too and earn points for inviting your friends (full disclosure here!). I've signed up for a bunch of sites and have some invites, so you can use these links to join the fun: Haute Look, Rue La La, Gilt, Ideeli, and Groupon. Haute Look: In addition to their sales on clothing, shoes, jewelery, makeup, sports memorabilia (shhh don't tell my husband), and chocolates (psstt tell my husband), they have some very affordable housewares sales. Currently, they have some very cute dining and china on sale. 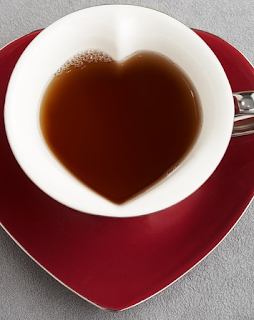 I'm not usually a total girly girl but I can't resist this cute heart shaped tea and saucer set, a 6 person set for $30. Use this link to join Haute Look. Rue La La: Currently has plush W Hotel brand bedding for sale and other sales for clothes, jewelery, shoes, and cruises. You can access the sales here. 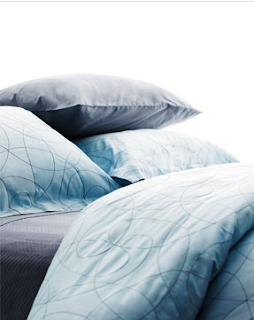 Gilt: Currently has designer bedding and gifts on sale. Like this very cute hammered stainless steel platter by Michael Aram for $15. 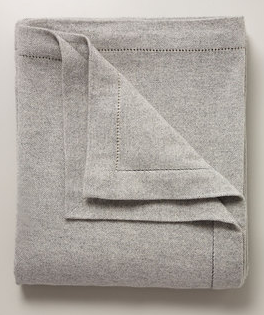 But be warned, Gilt has a mix of affordable stuff like the $15 platter and some super expensive stuff like this Vera Wang cashmere blanket. Yes, it's Vera Wang. Yes, it's cashmere. Yes, it's on sale for 60% off. No, I would never pay $998 freakin dollars for a blanket! The $15 pretty platter is a different story though, it's dishwasher safe and all! To sign up for Gilt, just use this link and you will be taken to my invitation. 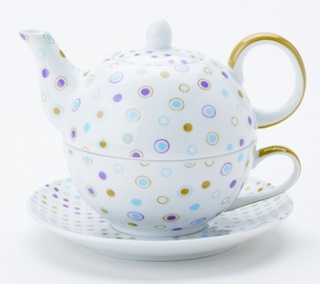 Ideeli: Has mostly clothes, accessories, and luggage for sale but has some houseware too, like this upcoming sale for Yedi Housewares. You can join here. Some other sites I've joined are Groupon which provides awesome discounts to local stores and restaurants, Beyond the Rack which has clothes and accessories, and Shop It To Me (email me and I'll send you an invite) which searches the internet sends you sales for the brands you like to buy. Have you discovered any other sample sale sites or gotten any awesome deals? Do tell! We’ve been cooking up some more progress in our kitchen makeover. Once our granite countertops were in, our next step was to install a kitchen backsplash. We browsed several tile and home improvement stores and decided on 1” x 2” brick shaped ceramic tile from Lowes. The tiny tiles are attached together like mosaic tiles to form a 12" x 12" sheet which made installation easy. We also chose them because they're brown and tan earth tone colored which nicely unifies the brown in our new counters with the tan of our existing tile floor. We started the backsplash installation by covering our new counters with newspapers to prevent any adhesive or grout from dripping on them. Then we removed the outlet covers and sanded down any glue that was left over from the countertop border we previously had. After the prep work, the fun began! This was my first tiling job so I wasn’t quite sure what to expect, but I was pleasantly surprised to find out how easy it was. The helpful folks at Lowes recommended an easy-to-use adhesive and grout which made the process much simpler and faster (and no one is paying me to say this, it’s my honest review!) We started by spreading Tec Ready to Use Adhesive onto the walls and then simply stuck the 12” x 12” sheets of tile on top. Like the name implies, the adhesive is ready to use straight from the tub and no mixing of anything is involved. Simply spread on the walls in an even coat and stick the tiles on top, easy as pie! Between each sheet of tile, we used plastic tile spacers to ensure there were equally sized gaps for grouting later on. It only took us a few hours to adhere all of the tiles to the wall and then we let it set overnight. The next day, it was time to grout. Grouting was also super easy because we chose another pre-mixed ready to go product, Tex Ready-to-Use Grout in Casual Beige. It’s a little pricier that regular grout (which is typically a powder that you mix with water), but unlike regular grout which requires sealing afterwards, the ready-to-go stuff doesn’t require sealant which makes the price difference less noticeable. Plus as an inexperienced grouter, I enjoyed the peace of mind of not having to worry about mixing the exact amount of water into the grout, and risking ruining it with the wrong amount. Working in small sections, we simply slathered the grout on top of the tiles, making sure the gaps between each tile were completely filled. After a couple minutes, we wiped the tiles down with a wet, and then dry, sponge to remove any excess grout from the top of the tiles. This was the hardest part of the grouting process because we needed to give the grout a little bit of time to set, but we also had to act quickly and wipe it off fast enough to ensure the grout didn’t dry on top of the tiles. For this reason, it’s really important to work in small sections and only grout a small area at a time. But after a couple of hours, and a few more passes of sponge cleaning the tiles, our grout was done! I was so surprised at how easy the process was (which is mostly due to the products we used and because the 12” x 12” tiles are fast to install). I was so happy, I even wandered around the house seeing what else I could tile! But no more tiling projects for us just yet, we still have to finish our kitchen makeover by painting the walls and adding some decorative cabinet trim. In the meanwhile, here’s a sneak peek at how our kitchen is looking so far, renovation mess and all! Adding the backsplash already makes the kitchen look much more finished. The project is shared on Metamorphosis Monday, Make it Monday, Make the World Cuter, Made it Monday, Make Your Monday, Diy Day. A chair from shopping cart! How creative is this! A bed made to look like a hamburger! Not only does this look just like a real hamburger, but it looks super comfy too. How creative and tasty! Stairs made of bookcases, what a cool use of space! Source: Found on Curious PhotosWhile I don't have any plans to add a shopping cart chair or hamburger shaped bed to my home, I find this furniture to be totally inspirational and a testament that imagination is your only limit when it comes to home decor! What do you find your creative inspiration from? For a while, I’ve been searching for a recycling system for my kitchen. Mail, cans, and other recyclables tend to stack up in our kitchen because it’s sort of a pain (read: we’re lazy) to always have to carry the recyclables into our garage where our large recycling bins are. I’d love a recycling sorting station like one of these, but simply don’t have the room. Finally, I stumbled onto the simplest solution that was under my nose the entire time. I took a couple of plastic storage bins which I already had and placed them on the floor of my kitchen pantry. One for paper/cardboard and one for cans/bottles (my town collects these together). Voila, instant recycling center! Now we have a convenient place to stash our recyclables. Once the bins get too full, we simply empty them into larger containers in our garage. It’s so simple I can’t believe it took me this long to figure it out! Any other recycling suggestions? How do you sort your recycling at home? Post shared on Reinvented, Picture Worth Thousand Words, We are that Family. We’ve been busy at work giving our kitchen a fresh new look with a makeover. While we don’t have the budget for a full kitchen remodel, we’ve chosen a few key things to renovate in the kitchen for an upgraded look (check out our kitchen remodel plan here). The most expensive and most impactful part of our kitchen remodel plan is new countertops. We decided to toss our plain, boring laminate countertops and replace them with some shiny new granite countertops! We chose granite over other materials because it’s pretty scratch resistant, durable (hot pots straight from the stove can even be placed on it), and because it provides a lot of bang for the buck. Since we’re keeping our cabinets as-is, we needed the counters to add some visual impact to the room. This is the only portion of our kitchen remodel that we’re not DIY-ing ourselves and hired a professional to do. We began by going to a stone-yard with our hired granite guy. There were tons of choices! We went to a few different granite yards to look at all the possibilities. There were a ton of different colors and patterns to choose from. I would definitely recommend going to a granite yard to choose your countertops, rather than choosing them from a sample a contractor might bring you. With a small sample, it’s hard to picture how a large granite slab would look in your kitchen. Plus, in the granite yard, you choose your exact slab. Since granite is a natural stone, no two slabs are the same so it’s best to see the exact slab you’re buying so you can ensure it doesn’t have any weird color patterns or other flaws. There are two main factors to consider when choosing granite countertops. The first is the pattern. Most granite pieces either have a small speckled pattern or a larger veined pattern. We chose a large streaky pattern. The second factor to think about when choosing granite, is the color. Granite comes in many colors including beige, green, reddish purple, brown, and black. Because we have light kitchen cabinets, we decided to go with a contrasting darker countertops. And because we know we’re going to sell our house eventually, we couldn’t pick anything too wild and needed a color that would appeal to most people. So…drumroll…we chose these black and brown granite countertops! We love the mix of colors which will look nice next to our light cabinets and bring out the brown shades from our tile floor. The actual granite installation was pretty quick and mess-free. Before installing it, our granite guy came over to take measurements and made a mock-up of our existing countertops. At this time, we chose to extend our counters to be a little longer on our peninsula and we chose an beveled edge. About a week later, the granite guy came back to actually install the countertops. The process was pretty quick and the results were amazing! Instantly our kitchen went from plain to pretty! So what do you think? Do you have granite in your home or did you choose a different material? Of course our kitchen remodel isn’t finished yet, so stay tuned to see the backsplash we choose, paint, and finishing touches. Post shared on DIY Day, Metamorphosis Monday, Making World Cuter, Make Your Monday, Made it Monday, Toot Your Horn Tuesday, Get Your Craft On, Show & Tell Wednesday. It’s hard to believe we’re almost in mid-January already, I’m still getting over the excitement of Christmas and New Years! But with a new year, come new resolutions of course. We moved into our house late in 2008, so much of 2009 was spent just furnishing it and getting situated. Once we were moved in, we tackled a few big projects like painting most of the house and our backyard makeover. But now that most of the “basics” are out of the way, we can really focus on refining our home design and customizing our spaces. Here are some of the things I hope to accomplish in 2010, otherwise known as my New DIYear Resolutions! Get Organized: My messy closets and drawers have to go. I'd like to tackle these areas throughout the year so that everything has it's place and I can get organized and stay organized. Finish Updating our Kitchen: We started updating our kitchen last month and the project is already in full-swing so I’m confident it will be completed within the next few weeks. I’ll be sharing the latest progress soon, but you can check out our kitchen upgrade plan in the meanwhile. New Fireplace Mantle: As you can see by my Christmas mantle photos, we have a pretty standard builder’s mantle that you may have seen in other homes. I’d like to update the mantle to add some style and function (we need a larger mantle to prevent our lovely tv from getting too hot while the fire is on). Front Yard Landscaping: Last year we worked on our backyard, so this year we’re focusing on our front yard. We have a small front yard with a tight walkway up to our front steps. 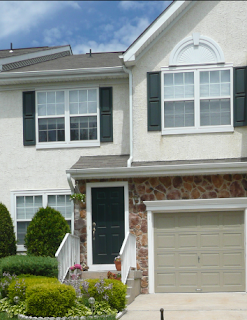 We’d like to expand the walkway and add some prettier plants and shrubs to spruce up our landscaping. Home Office Update: We have a pretty plain home office which doesn’t get as much use as it could. 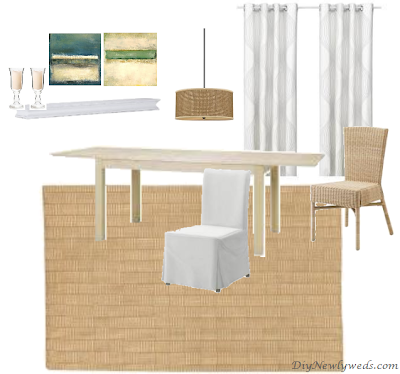 I’d like to make the room more stylish and functional, maybe even with a craft area. I don’t know if I’ll get the room to look as swoon-worthy as one of these inspirations, but I would like to add some craft space for myself. Photos from Apartment Therapy and BHG. Basement Improvement: While we don’t have the plans, or deep pockets, to finish our basement this year, I would like to make it more accessible in its unfinished state. Currently, we have a gym, pool table, and storage shelves in our unfinished basement. This year, I’d like to enhance the storage area and maybe even come up with some creative solutions to make the space look more finished without actually finishing it (with paint, fabrics, etc). Any suggestions? Looks like we’re cooking up another busy year in the Newlyweds household. Do you have any projects, or DIYear Resolutions, planned for 2010? Any tips for the ones I’d like to tackle? Not only were all of the tangled wires unsightly, but I couldn’t tell what was what and didn't know which of the cords I needed to unplug. Luckily I was able to clean up the entire area in just a few minutes! I always say, the best organization solutions are the ones that are the simplest to implement! I simply took some 1” address labels and folded them in half around the end of each power cord. Then on each label I wrote what each power cord was. Very simple, but it will save me a lot of aggravation next time I need to unplug something. If you don’t have any labels handy, you can try doing the same thing with masking or painter’s tape. Once I was already under the computer desk, I also cleaned up some of the excess wires by tying them shorter using some rubber bands. Another easy and almost-free solution! Like I said, very simple but effective! 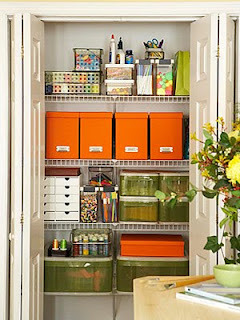 Do you have any easy tips to organize your home office or work area? HGTV recently revealed this year’s “dream home,” located in New Mexico. Each year, HGTV designs and builds a high-end, expansive home which is full of the latest trends in furniture and home decor. The dream home is a great way to see what’s popular and upcoming in the world of home design. But the best part is that one lucky viewer will actually win the home through their online dream home sweepstakes! The house is beautiful, but I was surprised that it includes so many modern and European design choices- decor I wouldn’t expect to find in New Mexico. But then again, I’ve never actually been to New Mexico so who knows! One of my favorite rooms of the house is the dining room. I love the use of natural fabrics and the airy feel of the room. But you don’t need a multi-million budget to achieve this look. Check out how I recreated this room using more affordable furnishings from Ikea, Target, and Bellacor. 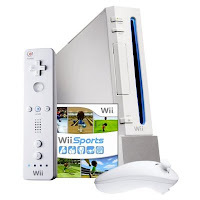 Nintendo Wii: Hubby totally surprised me this year and gave me a super fun Nintendo Wii system. 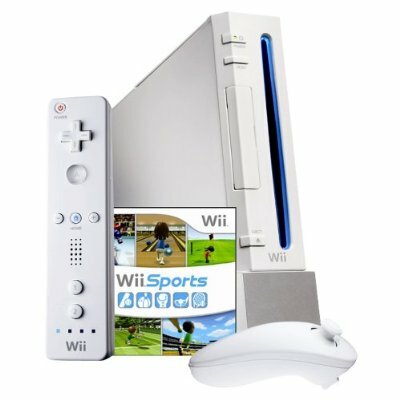 I’m usually not very good at video games and haven’t had a video game system since I was about 6 years old, but the Wii is totally up my alley. It is tons of fun and is easy to play even for the most inexperienced gamers. Plus it’s great for family get-togethers and a great way to spend time with my hubby. Wii Fit: For my new Wii, my sister gave us a Wii Fit system. Video games aren’t for couch potatoes anymore, the Wii Fit actually gets us up and moving around. It’s full of games and exercises and is totally fun! Entertainers Dining Set: My parents got me a set of 12 dinner plates, salad plates, and soup bowls. Bed, Bath, and Beyond has an awesome deal on this dinnerware which is white porcelain with either gold or silver trim. These dishes are an inexpensive (now just $10 a set on clearance!) 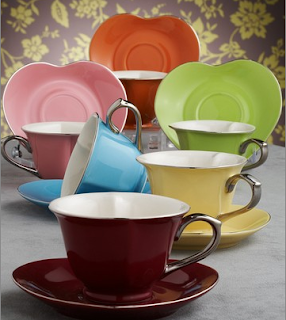 and are a perfect addition to anyone who needs dinnerware for parties but doesn’t have the budget for pricey china place settings. 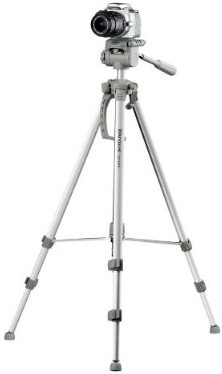 Camera Tripod: I got this Targus camera tripod from my hubby’s parents and it has already improved my photography already. It is great for group photos or when you need to keep the camera really steady, like if you’re taking photos in low-light or close-ups. I used it to photograph my Christmas tree and was able to get beautiful photos of the tree in low-light for once! I also got some books, clothes, and other goodies from my family. Like I said, I’m very lucky to have such a wonderful and generous family! I'd like to think that I gave them some great goodies as well. My favorite gift to give was perhaps the most unusual, but most rewarding. I got my sister a flock of chickens. Yes, chickens! Let me explain, I made a donation in my sister’s name to the Heifer International charity. This is a wonderful organization that helps empower people and fight hunger in the neediest parts of the world. The chickens I donated in my sister’s name will be given to a family in an impoverished country. The family will use the chicken’s eggs for nourishment and will sell any extra eggs as a source of income for themselves. 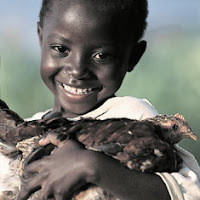 The gift will keep on giving, because once the family is able to they will pass on some of their chickens to another needy family in their village. I encourage everyone to check out and learn about the wonderful work done by Heifer International. Did you get or give any great gifts this season? Is there a charity you supported in 2009 or plan to get involved in this year? This summer, we worked on a big backyard makeover by installing a fence and adding a DIY patio. It was a ton of work, but after a few months of rest we’re ready to take on our next big home project…a kitchen renovation! Since we moved into our house about a year ago, we haven’t made any updates to our kitchen other than some small design touches (like these framed postcards and a new lighting fixture). But even with our personal touches to the kitchen, the room still looks pretty plain. The kitchen has some good bones to it, but needs some upgrades to add some life and personality to the room. The U-shaped design and the placement of the sink and appliances make it very easy to work in. And the kitchen island/peninsula provide plenty of work space and a cute place to dine and serve food during parties. But there are several things we don’t like about our kitchen. We have plain oak kitchen cabinets, boring laminate countertops, dull beige paint, and no wall backsplash. Boring all-around! Here’s our plan to renovate this space from a boring generic kitchen to an upgraded richer looking kitchen that I can be proud to cook in. And of course, we’ll do everything on a budget! Counters: Upgrade from the plain laminate countertops to shiny new granite counters! This will be the costliest part of our renovation, but will provide the biggest visual impact. Sink: The existing metal sink and faucet is one of my most-hated parts of the kitchen. No matter how much I scrub, it never looks clean and the sink is so shallow I end up splashing water everywhere when washing dishes. The sink and faucet will be replaced! Backsplash: Add a tile backsplash to compliment the new counters and add some style to the kitchen. Walls: Paint the walls to make the kitchen look more finished and less boring beige. 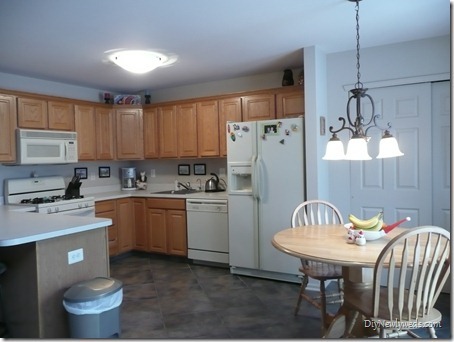 Cabinets: Since replacing the cabinets is too costly, we considered painting or staining them another color. I know painting oak cabinets white is very popular these days, but we ultimately decided against it for ourselves. I like the look of real wood in the kitchen so we are relying on some of the other updates (granite counters, tile backsplash, painted walls) in the kitchen to give the cabinets a new life. We’d also like to upgrade the cabinets by adding some new trim to make them look more interesting and upscale. Check back soon to see how our renovation is going! This project is shared on Diy Day., Show Off Your Stuff, Transformation Thursday, and Strut Your Stuff. As I mentioned in yesterday's Christmas round-up post, we recently made a very exciting addition to our family! If you paid close attention to yesterday's Christmas decor photos, you may have seen the clue I included. He is a miniature schnauzer and I still can’t get over how cute he is. He’s two and a half months old and is growing bigger and bigger by the day. We are thrilled to have him as part of our family! Happy New Year! I hope everyone had a wonderful holiday season and will have a wonderful new year in 2010! With all of the holiday craze, I didn’t have much time to post my holiday decorations. But I’m back now and wanted to share what’s been going on in the DIY Newlyweds household. The centerpiece of our holiday decor was our Christmas tree in the family room. This year, the tree was decorated with mainly red and gold glass ornaments. Other colored ornaments were also mixed in, but almost all of them had at least a touch of gold or red. To bring out the gold and red colors, I lighted the tree with a string of red lights near the core of the tree and two strings of white lights towards the outside of the branches. Next to the Christmas tree, I decorated the fireplace with a faux pine garland and added white lights and red and gold pinecone and poinsettia accents. Across the room, the staircase was decorated with another pine garland and accented with white lights, silver tinsel garland, and red ornaments. And finally, I decorated the coffee table with a red tray with white candles, gold ornaments, and a cute little color-changing led snowman candle. All of these Christmas decorations are still up and I’m continuing to enjoy them now. I know many people take their decorations down as soon as the new year arrives, but I like to keep them up and keep the holiday spirit around as long as possible. How did your holiday decor turn out this year? 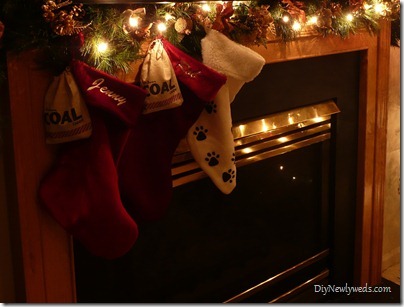 Have you packed up the decorations yet or do you plan to leave it up a little longer? Stayed tuned to see what else we’ve been cooking up and what’s been keeping us so busy at home. Hint, it involves a new addition to the family and another renovation project! 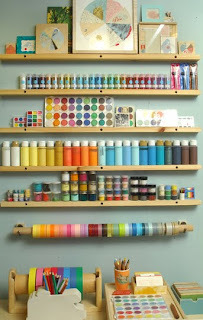 This post is shared on Diy Day and Inspired Room.